Discussion in 'Behaviors & Handling Techniques - Goats' started by FRED DESANTIS, Nov 7, 2018. 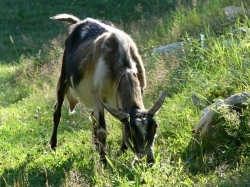 I would like to report everything is back to normal, she is out grazing with her pal's. I think the dog was a little to playful and freaked her out. So happy to hear that Fred, are you planning on breeding them ? Thats fantastic Fred, happy she is back to normal.